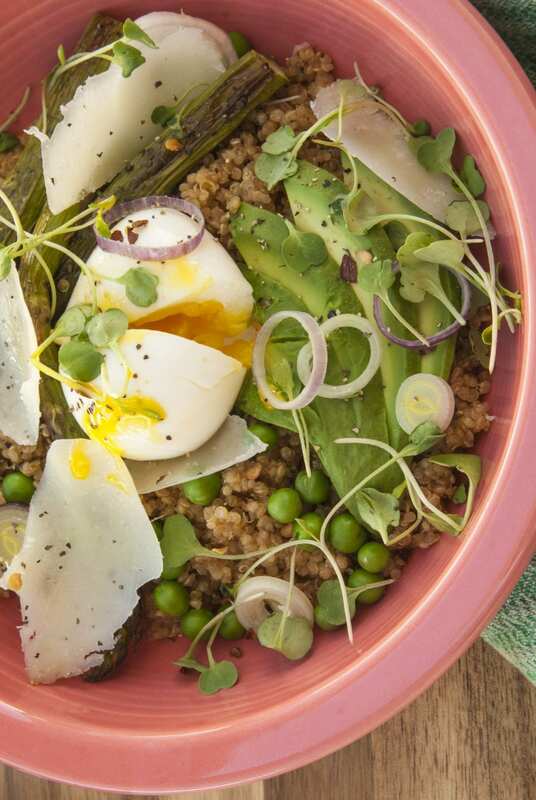 What better way to ring in spring with this Spring Quinoa Salad with Soft Boiled Eggs? Yay! Spring is here! One of my favorite seasons. Some of you may be thinking “Pipe down, we all have to wake up an hour earlier”. Well A) I am definitely one of those annoying types that you would call a “morning” person and B) not all of us do participate in this magic of changing the clocks. I don’t know why. Maybe Arizona was just like “screw it, that sounds like too much work” and now we just don’t. I respect it, we’re just rebels I suppose. Second to fall, spring in Arizona means the BEST weather/sunsets/activities to be doing all around town. Spring also means, a whole new slew of produce. Which is why I couldn’t wait to whip up this Spring Quinoa Salad. I mean really, I can use just about any excuse in the book to be eating asparagus. But the true star of the spring quinoa salad, you ask? Well none other than this beaut of a soft boiled egg. 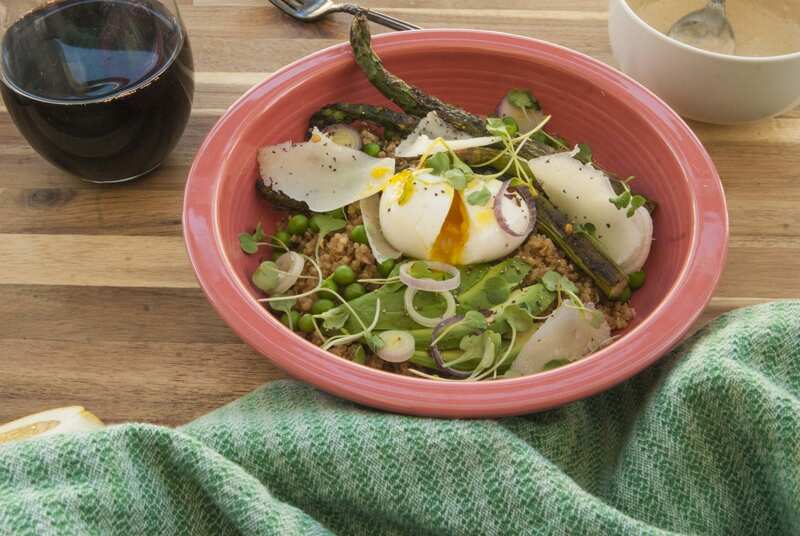 If you have never soft boiled an egg, this spring quinoa salad is begging for your attention. The outside is firm, but the inside is the savory cadbury egg you never knew egg-sisted (ha, did you catch that?). Seriously, make a few of these babies at a time and use them in salads, grains bowls, in soup… the list could go on. 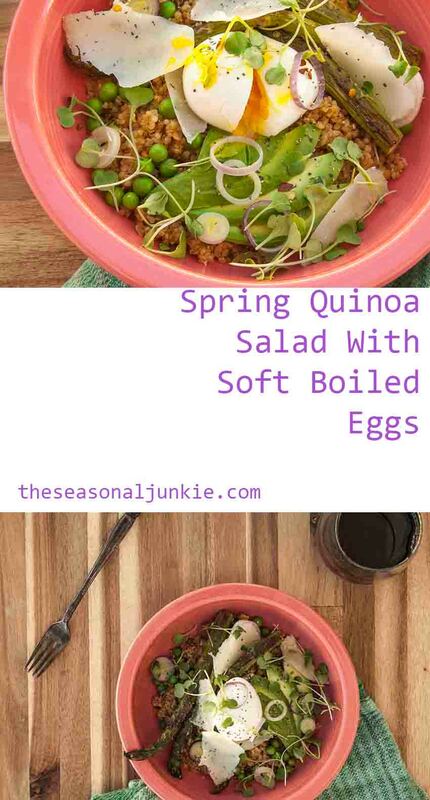 My inspiration for this spring quinoa salad came from my new book that I am OBSESSED with. The book is called Simple Fare by Karen Mordechai. 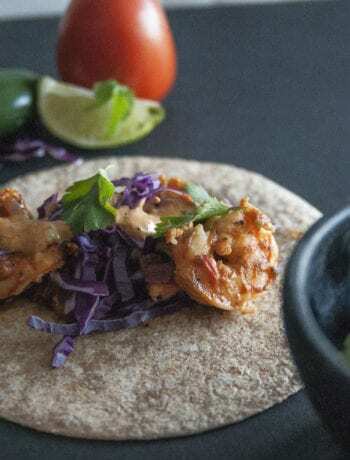 The food photography is amazing and the recipes are straight forward. If you are a foodie of any sort I highly recommend it. Click the title of the book to purchase it on Amazon. Anyways, I will actually pipe down now because I have some cake orders to get to and you have a spring quinoa salad to make. 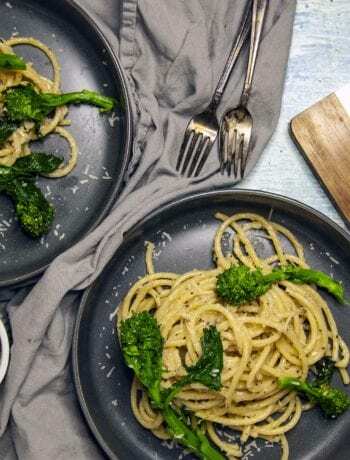 Get my recipe for the Lemon Garlic Tahini I topped this with here! I am not a huge fan of soft boiled eggs! I get weird about the yokes, but this looks tasty! 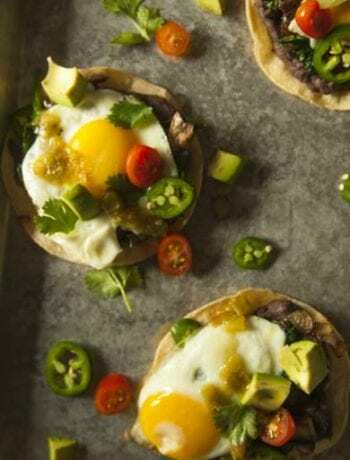 And I am going to put it on my “To Try” list, but I will probably make it with hard-boiled eggs! Quinoa Salad is one of my favourite! This looks absolutely amazing, I have to try it. It’s on my to-do list for this weekend. I’ve never tried quinoa period but this salad looks super tastey. Im gonna have to absolutely try this out. You definitely have to try it out, it’s so versatile. it looks great! 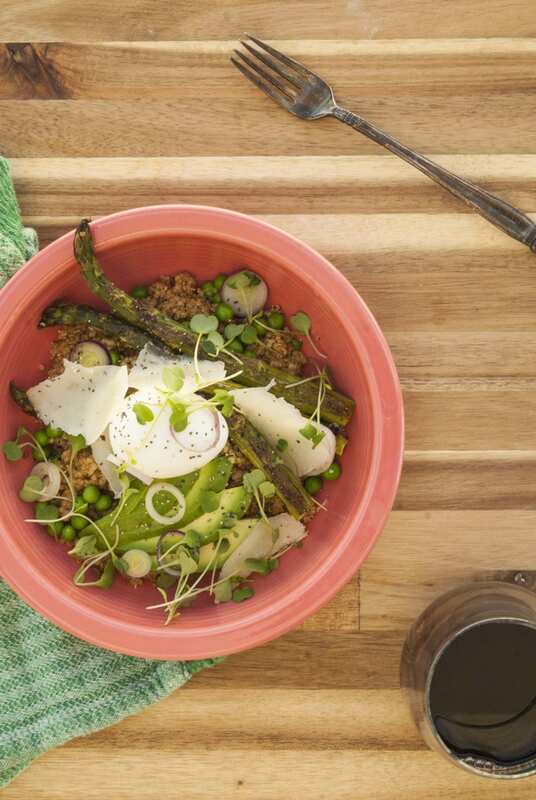 tbh i’ve always been a little scared to try quinoa, but seeing this recipe, i might try it! LOVE this post ! I definitely want to try to make this! And I’m subscribing right now too! Been looking for new healthy meals! Thank you for posting! Thank you, Terez!! I hope you enjoy it! Holy smokes, your recipes look fantastic! I too LOVE asparagus and I am excited to male some soft boiled eggs. I always overcook them! Question: I tend to make about 18 hard boiled eggs all at once and leave them in the fridge to Grab & Go can this be done with soft boiled? You can absolutely premake soft boiled, I do it myself. Thank you for your kind words!